. And I’m not exaggerating one bit. I was referred to Dry Dock Brewery by a patron at Breckenridge Brewery on Kalamath. 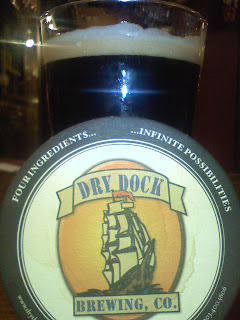 My friends and I were on a four day, 10 brewery tour and decided to try Dry Dock (Dry Dock was our 8th brewery of the weekend). Dry Dock is in a strip mall, typically I would avoid these types of breweries because, perhaps I’m biased, but I feel they just don’t have the space to make good beer. Boy oh boy was I wrong. Paragon Apricot Blonde, Urca Vanilla Porter, Naked Porter, U-Boat Hefeweisen, Double IPA (wow! ), just to make a few. Every sample I had, I loved even more. Even a friend who before, (gasp), only drank Miller Lite, (gasp), now is a fan of porters. Dry Dock is a quaint little brewery, they are not yet large enough to bottle their beer, the seating area is on the small side, but the atmosphere truly adds to the experience. Locals enjoy this place and you can run into the same friends on a weekly basis. Bartenders are nice and generous. Oh, and don’t expect to order food there, it’s a BYOF establishment (bring your own food). They have a menu from local food places that will deliver your food to the brewery. Totally agree! I live close enough to Dry Dock to visit a few times a week (time allowing). The first time I went there, I too was blown away by not just one, but *every* beer they brew. Their Friday Firkins can get a little…weird…but otherwise their beer is FANTASTIC!